“When are you going to write about us?” asked the gentleman. I looked up from signing the visa receipt, smiled and said, “Oh I’m mulling it over; believe me.” That was 4 months ago. Now every time I walk in the liquor store and see the friendly men sitting behind the counter I feel guilty for having not written about them yet. I have vivid childhood memories of accompanying my parents to “the state store”. I knew the scotch and crème de menthe my parents bought were grown up party drinks, but kids like me were still welcome in the joint. Why else would they have provided those miniature shopping carts? Apparently kids are also welcome (as long they’re accompanied by someone over 21) in North Carolina state liquor stores because they too have those shiny miniature shopping carts. Some days I feel kinda self conscious using one of those carts—not because I’m buying more bottles than I can safely carry in my arms mind you, but you know, what if some cute kid came in with their parents and I was hogging the last cart? When I don my Sandwich Woman cape and fly to Ft. Myers, Florida to attend to my parent’s latest medical issue, I use the big girl shopping carts. In the wine section at Publix. While Publix has a liquor store (with a separate entrance) next to the grocery, I feel like I’d be cheating on my local liquor guys. Besides, what if I got in there and they don’t have those miniature carts? Would I know how to function? If I do get a taste for a martini or a vodka tonic, all is not lost. Whichever of my brothers visited last always leaves behind a nice stash. Frankly, it’s one of the most thoughtful gestures those boys bestow upon me these days. Or ever. With mom and dad unable to imbibe due to current medications, those bottles of Liquid I-Can-Cope just sit around waiting for me. That’s the upside. The downside? For some reason when I go to crack open the liquor cabinet, located in the great room right outside my parent’s room, I feel like an underage child trying to sneak a drink. I’ve figured out how to open the doors reeeeeeeeeal quite-like, then tip toe to the garage frig where I stowed the tonic (God bless Publix for selling it in 2 liter bottles). It’s like if they can’t enjoy their evening adult beverages, neither should I. Luckily, the neighbors let me use their recycling bins for the Empties. 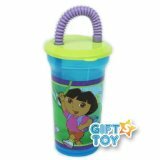 And God forbid anyone asks for a sip of my “orange juice” I schlep to the hospital in my niece’s Dora The Explorer sippy cup. During my dad’s latest quick outpatient visit — which lasted 3 days — Dora was my new best friend. I mean, coffee and cafeteria fare only goes so far. Alas, after two years of assuming this role, I’ve learned a relaxed Sandwich Woman is a more effective and patient Sandwich Woman. And in mulling it over, believe me, I owe my parents at least that.